Country Great Merle Haggard plays the Country Preacher in MY FOOL HEART. The Country Music Hall of Fame calls Mr. Haggard “with the arguable exception of Hank Williams, the single most influential singer-songwriter in country music history.” With 40 #1 hits over a career of nearly 50 years and with a new album, I AM WHAT I AM, that hit this year’s #1 on the Americana charts, Merle Haggard is unmatched in country music. Along with Buck Owens, he defined the Bakersfield Sound, a brand of country music. In the 1970′s, he became identified with outlaw country music. As a young man, Merle Haggard spent some years in San Quentin Penitentiary where he saw Johnny Cash in concert. In later years, Johnny Cash said, “Hag, you’re the guy people think I am.” Johnny Cash encouraged Merle to write about his experiences in his songs. “Going to prison has one of a few effects,” he told Salon in 2004. “It can make you worse, or it can make you understand and appreciate freedom. I learned to appreciate freedom when I didn’t have any.” As Governor of California, Ronald Reagan pardoned Merle Haggard. He would later play at the White House for President Reagan. Producer Don Was, who has worked with Bob Dylan, the Rolling Stones and Bonnie Raitt, told Newsweek in 1996, “He’ll tell you he’s a country singer, but to me the essence of rock and roll is a cry for freedom and rebellion. And I don’t know anyone who embodies it better. 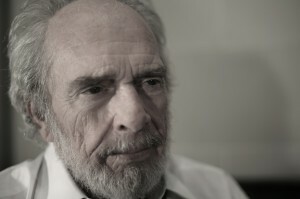 Every aspect of his life is a refusal to submit.” Merle Haggard is truly a legend.